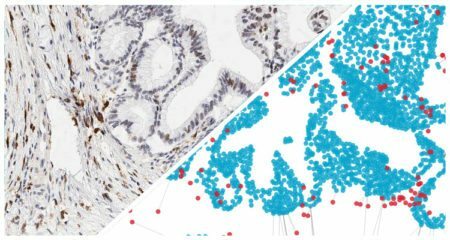 Particularly useful to those involved in the immune-oncology field, the Spatial Analysis module offers a suite of subsequent analysis tools which can be used to identify proximity and relative spatial distribution of objects, cells, and/or features across single tissues or serial sections. 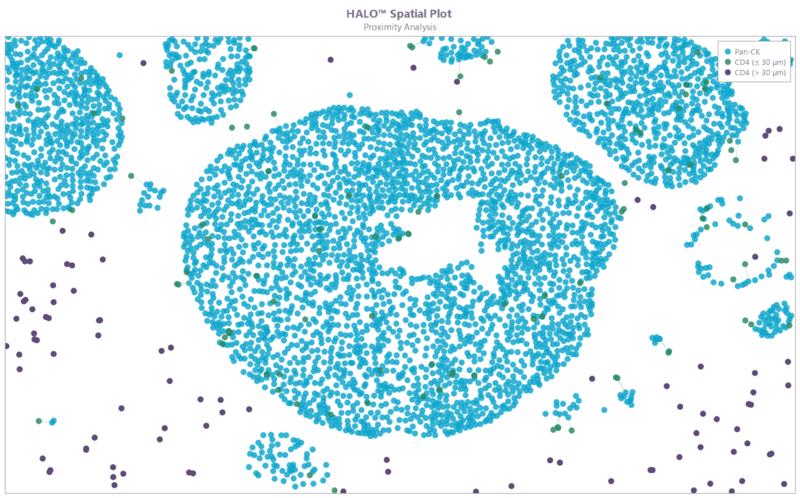 This module is embedded within the HALO platform and can be used in conjunction with any of our cell-based analysis modules for brightfield or fluorescence. Determine the average distance and number of unique neighbors between any two cell or object populations. The example below depicts pan cytokeratin positive cells (blue) and CD4 positive cells (red). 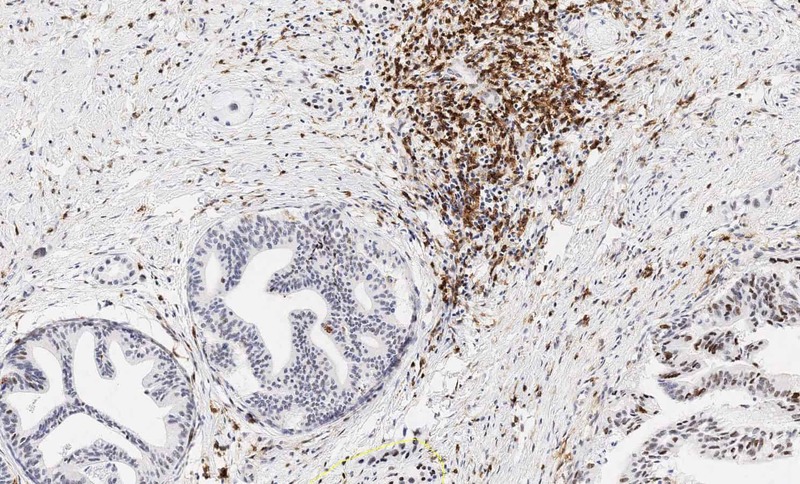 Grey lines connect each CD4 positive cell to the nearest pan cytokeratin positive cell. Calculate the number of objects or cells within a certain distance of another object or cell. In the example below, the distance is set to 30 microns. CD8 positive cells within 30 microns of a pan cytokeratin positive cell (blue) are labeled green and CD8 positive cells greater than 30 microns from pan cytokeratin positive cell are labeled purple. A corresponding proximity histogram is automatically generated. Determine the number of objects or cells within a set range of an annotated region of interest. Depicted below is a whole slide image stained with CD8. The tumor boundary has been defined/annotated in green. 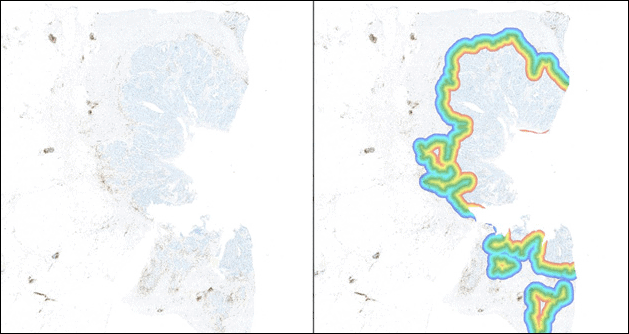 The infiltration analysis tool defines the invasive margin inside of tumor (yellow and red) and the invasive margin outside of the tumor (blue and purple) automatically. In this example, the distance is set to 500 microns around the annotated tumor boundary. CD8 positive cells are quantified within the margin. A histogram is automatically generated to reflect CD8+ cell density inside the tumor boundary (-1 to -500), at the tumor boundary (0), and outside the tumor boundary (+1 to +500) as shown in the image below. 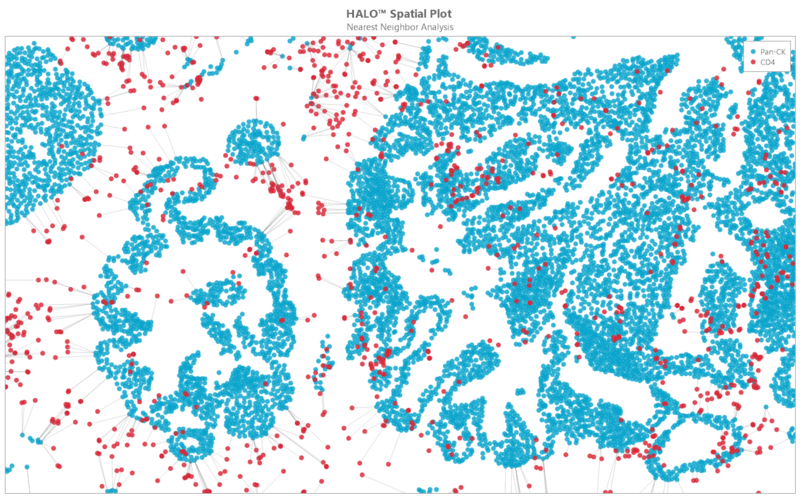 The Spatial Analysis module integrates seamlessly into the HALO™ platform and is compatible with a number of file formats. 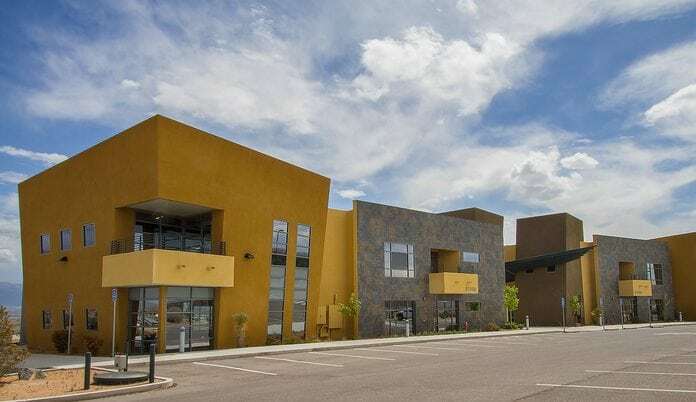 Contact info@indicalab.com for product demonstration and pricing information or upload some images for a free trial. HALO is compatible with a broad spectrum of image and digital slide formats. Yours not on the list? Email us your requirements. 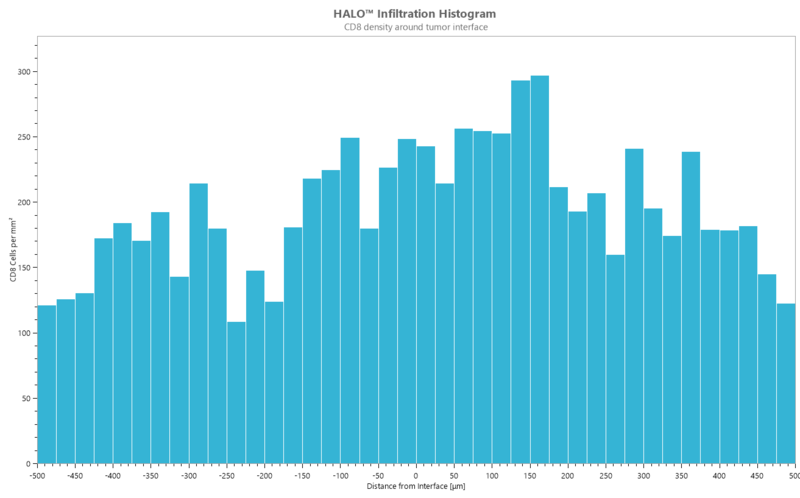 Use the form below to upload up to three images for us to analyze using HALO. If the form does not display, please click here.